State Representative John Piscopo (R-76) joined local leaders and residents at the grand opening and ribbon cutting celebration for H & R Block in Thomaston on Saturday, January 19. H & R Block is an American tax preparation company operating in North America, Australia, and India. The company was founded in 1955 by brothers Henry W. Bloch and Richard Bloch. As of 2018, H&R Block operates approximately 12,000 retail tax offices staffed by tax professionals worldwide. After the ribbon cutting, Rep. Piscopo presented the team with a legislative citation to commemorate the occasion. “We wish them the best of luck in their new location here in Thomaston with the hope that it will bring them greater prosperity,” said Thomaston First Selectman Ed Mone. H & R Block is located at 76 Watertown Road, Thomaston. (l to r): Jan Ubermuth, Joann Pacyna, State Representative John Piscopo (R-76), JoAnn Ryan, President & CEO of the NorthWest Chamber of Commerce; Ed Mone, Thomaston First Selectman; Wendie Grabel, Matthew Grabel Franchisee Owners and Gary Gallagher. 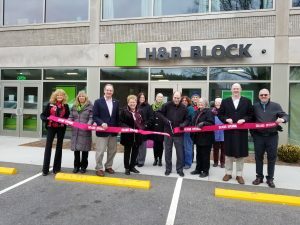 (Back Row) H & R Block employees Pat Bougie, Ann Abrahamson, Marie McCarthy, and clients Bill and Margaret Berg at the grand opening and ribbon cutting celebration for H & R Block in Thomaston on Saturday, January 19. Piscopo represents Thomaston, Burlington, Harwinton & Litchfield in the General Assembly.